Age and Qualifications of Holder. A rabbinical diploma; a written certificate given to one who, after a thorough examination, proves himself competent and worthy to be a rabbi. It is a substitute for the "semikah," which could be conferred only in Palestine, by a member of the Sanhedrin. The hattarat hora'ah, unlike the Christian ordination, confers no sacred power, and is not a license; it is simply a testimonial of the ability of the holder to act as rabbi if elected. A community had, however, a perfect right to, and often did, elect a rabbi who had no diploma. The diploma was regarded as a merely formal document acquainting the people that the person named in it was fit to teach and to render decisions. A scholar who succeeded as principal of the yeshibah, or who acted as colleague of the rabbi, was not required to hold a diploma. Some authorities, however, require that a rabbi have a "degree" in order to be entitled to perform the rite of "ḥaliẓah" or to grant a divorce (annotations to Shulḥan 'Aruk, Yoreh De'ah, 242, 14). The usual title of a Babylonian scholar was "Rab"; of one ordained in Palestine, "Rabbi." Later on the title "Rabbi" was indiscriminately used for every scholar who held a rabbinate. Thus the title "Rabbi" lost its value among the Ashkenazim. The Sephardim, however, still held it in respect as a mark of great learning. The ordinary scholar they called "ḥakam"; and the chief among them is called in Turkey "ḥakam bashi" (see David Messer Leon in "Kebod Ḥakamim," ed. Meḳiẓe Nirdamim, p. 63, Berlin, 1899). (geonic responsa "Zikkaron la-Rishonim," § 180; ed. Harkavy, iv. 80, Berlin, 1887). "We have appointed Peloni b. Peloni [i.e., N, son of N] a justice in the town of . . . and have invested him with authority to administer the civil laws, and to supervise all matters relating to the Commandments and to things prohibited and permitted and to things connected with the fear of God. And whosoever will not obey the verdict, he (the judge) has authority to deal with him as he thinks proper. The miscreant is likewise liable to [the punishment of] Heaven"
This document, given by the principals of theBabylonian yeshibot, was of an authoritative nature. It invested the recipient with full power to act, in his limited jurisdiction under the Greco-Roman or Persian rule, in matters of religion and civil law. The justice could compel a defendant to appear before him for judgment. But, unlike the justice who obtained the Palestinian semikah, he had no right to impose monetary fines ("ḳenas"), nor to inflict the regulation stripes ("malḳut"), much less capital punishment (Sanh. 31b). He could, however, at his discretion imprison and inflict light bodily punishment for various offenses. This quasi-semikah was kept up in Babylon during the Middle Ages. 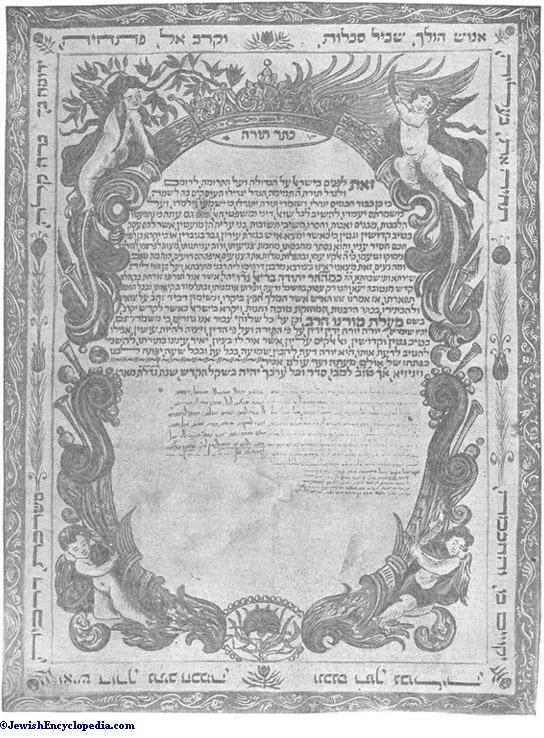 The rabbinical diploma was known in the thirteenth century as "ketab masmik," e.g., in the collection of Barzilai, "Sefer ha-Sheṭarot" (p. 131, Berlin, 1898). Maimonides speaks of Samuel ha-Levi as "the ordained rabbi of Bagdad" ("Iggeret ha-Rambam," art. "Resurrection") with more or less right of special jurisdiction. 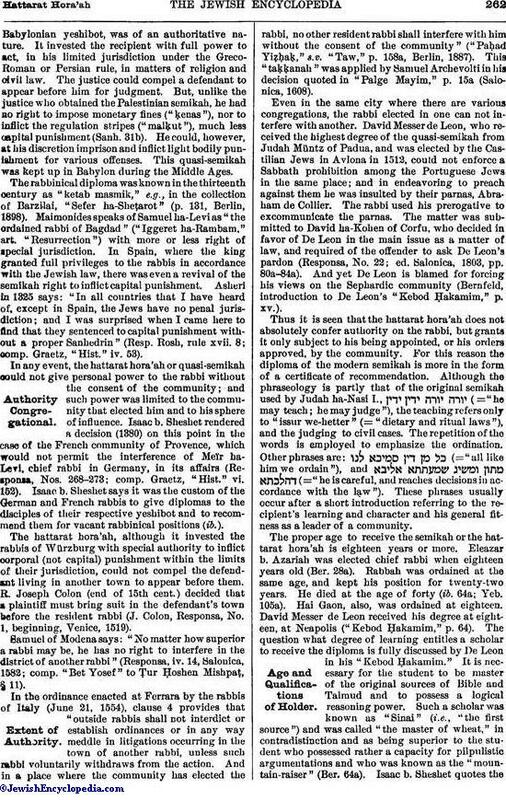 In Spain, where the king granted full privileges to the rabbis in accordance with the Jewish law, there was even a revival of the semikah right to inflict capital punishment. Asheri in 1325 says: "In all countries that I have heard of, except in Spain, the Jews have no penal jurisdiction; and I was surprised when I came here to find that they sentenced to capital punishment without a proper Sanhedrin" (Resp. Rosh, rule xvii. 8; comp. Graetz, "Hist." iv. 53). In any event, the hattarat hora'ah or quasi-semikah could not give personal power to the rabbi without the consent of the community; and such power was limited to the community that elected him and to his sphere of influence. Isaac b. Sheshet rendered a decision (1380) on this point in the case of the French community of Provence, which would not permit the interference of Meïr ha-Levi, chief rabbi in Germany, in its affairs (Responsa, Nos. 268-273; comp. Graetz, "Hist." vi. 152). Isaac b. Sheshet says it was the custom of the German and French rabbis to give diplomas to the disciples of their respective yeshibot and to recommend them for vacant rabbinical positions (ib.). The hattarat hora'ah, although it invested the rabbis of Würzburg with special authority to inflict corporal (not capital) punishment within the limits of their jurisdiction, could not compel the defendant living in another town to appear before them. R. Joseph Colon (end of 15th cent.) decided that a plaintiff must bring suit in the defendant's town before the resident rabbi (J. Colon, Responsa, No. 1, beginning, Venice, 1519). Samuel of Modena says: "No matter how superior a rabbi may be, he has no right to interfere in the district of another rabbi" (Responsa, iv. 14, Salonica, 1582; comp. "Bet Yosef" to Ṭur Ḥoshen Mishpaṭ, § 11). In the ordinance enacted at Ferrara by the rabbis of Italy (June 21, 1554), clause 4 provides that "outside rabbis shall not interdict or establish ordinances or in any way meddle in litigations occurring in the town of another rabbi, unless such rabbi voluntarily withdraws from the action. And in a place where the community has elected the rabbi, no other resident rabbi shall interfere with him without the consent of the community" ("Paḥad Yiẓḥaḳ," s.v. 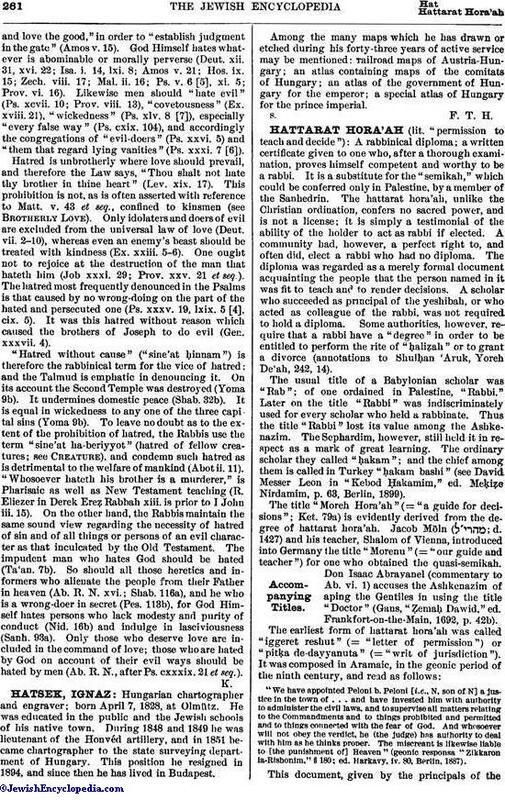 "Taw," p. 158a, Berlin, 1887). This "taḳḳanah" was applied by Samuel Archevolti in his decision quoted in "Palge Mayim," p. 15a (Salonica, 1608). Even in the same city where there are various congregations, the rabbi elected in one can not interfere with another. David Messer de Leon, who received the highest degree of the quasi-semikah from Judah Müntz of Padua, and was elected by the Castilian Jews in Avlona in 1512, could not enforce a Sabbath prohibition among the Portuguese Jews in the same place; and in endeavoring to preach against them he was insulted by their parnas, Abraham de Collier. The rabbi used his prerogative to excommunicate the parnas. The matter was submitted to David ha-Kohen of Corfu, who decided in favor of De Leon in the main issue as a matter of law, and required of the offender to ask De Leon's pardon (Responsa, No. 22; ed. Salonica, 1803, pp. 80a-84a). And yet De Leon is blamed for forcing his views on the Sephardic community (Bernfeld, introduction to De Leon's "Kebod Ḥakamim," p. xv.). Thus it is seen that the hattarat hora'ah does not absolutely confer authority on the rabbi, but grants it only subject to his being appointed, or his orders approved, by the community. For this reason the diploma of the modern semikah is more in the form of a certificate of recommendation. Although the phraseology is partly that of the original semikah used by Judah ha-Nasi I., (= "he may teach; he may judge"), the teaching refers only to "issur we-hetter" (= "dietary and ritual laws"), and the judging to civil cases. The repetition of the words is employed to emphasize the ordination. Other phrases are: (= "all like him we ordain"), and (="he is careful, and reaches decisions in accordance with the law"). These phrases usually occur after a short introduction referring to the recipient's learning and character and his general fitness as a leader of a community. Rabbinical Diploma of the Seventeenth Century. The proper age to receive the semikah or the hattarat hora'ah is eighteen years or more. Eleazar b. Azariah was elected chief rabbi when eighteen years old (Ber. 28a). Rabbah was ordained at the same age, and kept his position for twenty-two years. He died at the age of forty (ib. 64a; Yeb. 105a). Hai Gaon, also, was ordained at eighteen. David Messer de Leon received his degree at eighteen, at Neapolis ("Kebod Ḥakamim," p. 64). The question what degree of learning entitles a scholar to receive the diploma is fully discussed by De Leon in his "Kebod Ḥakamim." It is necessary for the student to be master of the original sources of Bible and Talmud and to possess a logical reasoning power. Such a scholar was known as "Sinai" (i.e., "the first source") and was called "the master of wheat," in contradistinction and as being superior to the student who possessed rather a capacity for pilpulistic argumentations and who was known as the "mountain-raiser" (Ber. 64a). Isaac b. Sheshet quotes the responsum of Asheri against those who decide blindly by Maimonides' code without having a thorough knowledge of the Talmud; and as an example he refers to a great man of Barcelona who admitted that he could not comprehend the Yad ha-Ḥazaḳah on Zera'im and Ḳodashim because he had not a sufficient knowledge of the sources of these halakot and of the respective treatises in the Talmud (Responsa, No. 44, end). David ha-Kohen of Corfu complains bitterly against those rabbis who "ride on the horse of rabbinism" and who render decisions without seeing the light of the Talmud or the light of wisdom, but have the gift of the tongue to raise themselves up to the high position (Responsa, xxii. 80a). Other authorities complain of the appointment of rabbis through the action of the government, or through the influence of money, when the appointees do not possess the necessary qualifications of a rabbi (J. Weil, Responsa, No. 68; see Yer. Bik. iii. 3; Sanh. 7b). Orthodox congregations recognize a hattarat hora'ah only when issued by a rabbi of acknowledged authority who has personally examined the candidate. "Verily, these words of truth may be ascribed to that worthy man, the rabbi . . . , a native of . . . , with whom I have discussed fully, and [found] he is filled with the Word of the Lord in Talmud and in the Codes. He is also an excellent preacher, preaching what is moral and practising the morals he preaches. Therefore I say: Let his power and might in the Torah be encouraged. Let him teach and decide in matters of monetary law; dietary and rituals; geṭ and ḥaliẓah rites; laws relating to pure and impure. And may it be the will of the Merciful to secure him an honorable position according to his honor. As the said rabbi deserves and is able to lead a holy community [lit. "sheep"], I have signed this week-day, . . ., day in month, . . . , and year. . . .
"So says Isaac Elhanan, who dwells with the holy congregation of Kovno." 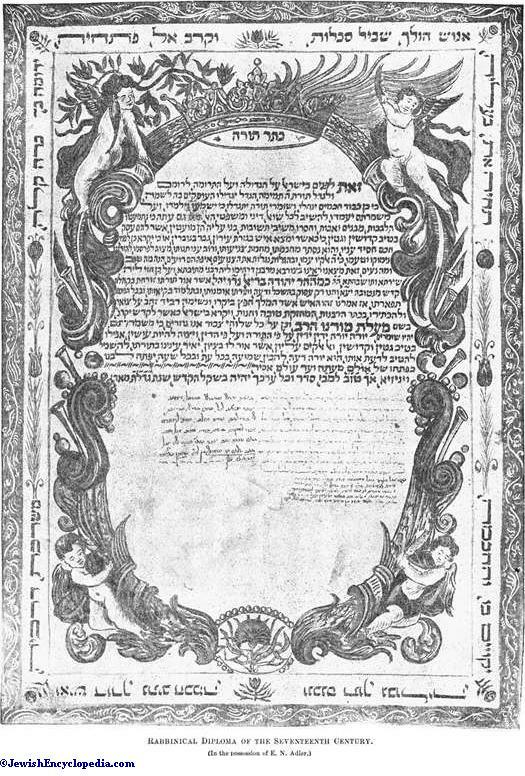 This form of degree pronounces the holder to be a full-fledged rabbi ("rosh ab bet din" = "the chief of bet din"), while a simple hattarat hora'ah is sometimes given to a dayyan or moreh hora'ah permitting him to render decisions only in dietary and ritual laws ("issur we-hetter"), in which case the limitation is so specified. The certificate given to a shoḥeṭ permitting him to slaughter animals or fowls for kasher meat is designated "ḳabbalah" (= "accepting [authority]"). Graduates from modern rabbinical seminaries, such as those at Breslau and Budapest, receive not only a hattarat hora'ah signed by the professor of Talmudics, but also a diploma in the vernacular. A Reform Diploma. "Aaron Chorin, Chief Rabbi." "Before the Congregation, I thank God for His goodness in gratifying my perpetual desire, that the wise in Israel may take to heart the words of our great master Maimonides, to reconcile the Mosaic Law with philosophy, that truth and peace, goodness and virtue, may be spread and fortified. Praised be God that I have now found a highly learned and wise man, well versed in the Jewish Law, and in other useful branches of science; for all these are combined in my dear friend Leopold Zunz. I therefore ordain him to be a rabbi, and empower him with the right to act and decide in matters pertaining to permissions and prohibitions, and especially in matters of marriage and divorce, in accordance with his wisdom and thorough knowledge of the Mosaic Law. With this, he assumes the duty of teaching the Jewish community, by preaching reverence to God, and drawing men nearer to His teachings and His commandments. May our Father in Heaven support him, and grant him strength in his position, that he may reflect honor on all Israel. "By authority of the State of Ohio, and the Union of American Hebrew Congregations. We, the Faculty and the Board of Governors of this Hebrew Union College, hereby testify that the possessor of this Diploma, . . . , was a regular and successful student of the Rabbinical Course of this College, and of the Academic Course of the University of Cincinnati; and, furthermore, that, at the Regular Final Examination in June, . . . , he proved his competency and worthiness to receive the honors of this College. Therefore, We confer on him the Degree and Title of Rabbi, to be known hereafter as Rabbi . . . , ordained and licensed to perform all Rabbinical functions in the name of God and Israel. In Testimony Whereof, We have appended our names and the seals of the Hebrew Union College and the Union of American Hebrew Congregations. "Done in the City of Cincinnati, Hamilton County, State of Ohio, this . . . day of . . . , in the year . . . A.M. (. . . C.E.)." 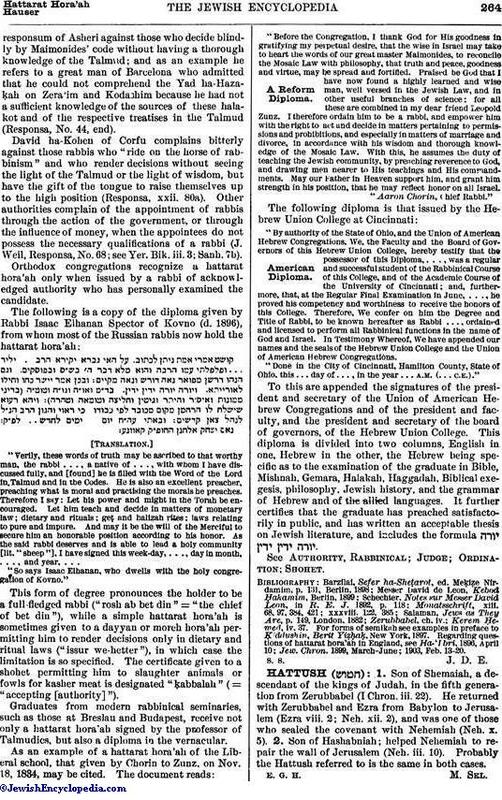 To this are appended the signatures of the president and secretary of the Union of American Hebrew Congregations and of the president and faculty, and the president and secretary of the board of governors, of the Hebrew Union College. This diploma is divided into two columns, English in one, Hebrew in the other, the Hebrew being specific as to the examination of the graduate in Bible, Mishnah, Gemara, Halakah, Haggadah, Biblical exegesis, philosophy, Jewish history, and the grammar of Hebrew and of the allied languages. It further certifies that the graduate has preached satisfactorily in public, and has written an acceptable thesis on Jewish literature, and includes the formula . See Authority, Rabbinical; Judge; Ordination; Shoḥeṭ. Jew. Chron. 1899, March-June; 1903, Feb. 13-20.